Your garage door has been there for you over the years protecting your home from inclement weather and keeping it safe from intruders. But just like every other part of your home, it will wear out after about 10 to 15 years. So if your door could use a refresh, or isn’t working as smoothly as it once did, call Overhead Door of Sioux City and Yankton™. We can show you all our new door options. Overhead Door of Sioux City and Overhead Door of Yankton offers the latest and greatest designs and styles of residential doors. Custom Steel – Our Custom Steel doors offer exceptional performance, low maintenance and durability in a wide variety of styles. Overhead Door Customized – Customized doors allow you to take a little of this and a little of that and put it together for a look that’s all your own. Custom Overlay and Glass – Durable, insulated steel is covered by one-of-a-kind looks that transform the door from carriage to modern and everything in between. Glass options range from arched to square, one row to a full door. 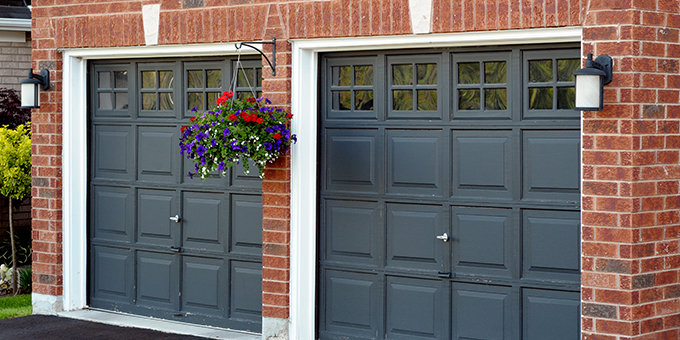 Our Thermacore collection is our most popular garage door. It features premium construction with maximum thermal efficiency. Standard Paint – These doors are available in nine standard colors: white, almond, desert tan, sandstone, brown, terra bronze, hunter green, gray and black. They can also be painted to match your home’s exterior. Woodgrain Finish – The woodgrain finish comes in three colors: golden oak, walnut and mission oak. There are several panel designs to choose from. Aluminum doors are sleek and sophisticated for today’s more contemporary-styled homes. They come in two models, 511 in a standard frame and 521 with a wide, heavy-duty frame. Clear Aluminum Finish - The clear finish is standard. Dark bronze and black anodized finishes are also available. Custom Powdercoat Finish - There are 200 powder coat color options to best match your home. Color samples are available by request through your local Overhead Door Distributor. Carriage house styles enhance the curb appeal of your home while providing superior thermal performance and durability. Wood Overlay Carriage House – These doors come in a variety of stained finishes: mahogany, walnut, oak, green, gray, clay, Honduran/mahogany and red oak. Steel Overlay Carriage House – The Steel Overlay Carriage House doors are available in a variety of painted finishes, including: white, gray, clay, green and two-town options with white trim boards. Whether you choose classic raised panels, wainscot inspired designs or contemporary long panels, you can’t go wrong with traditional steel. Standard Steel With Options - These doors comes in a wide assortment of neutral tones that complement any exterior. Standard Steel – Standard steel doors offer durability at our most affordable price. Two coats of baked-on polyester paint provide a low-maintenance finish that looks great for years to come. Give us a call today, we can help you determine which garage door is best for you and we’ll give you a free quote. For over 50 years, Overhead Door Company of Sioux City and Yankton has offered top quality garage doors and openers, installation, and service. © 2019 Overhead Door Corporation. All rights reserved.